There’s a reason I’m not much of a betting man. That reason being that I’m crap at it, despite my instincts telling me otherwise. Every so often, my theories about sporting events come true and, afterwards, I usually curse myself for not placing just a small amount of money on the outcome. The most recent example of this came at the end of February. One of my oldest and closest friends invited me along to watch the Arsenal vs Tottenham game. He supports the home side, whereas I am a Tottenham fan. Before, the game, we sat down for a bite to eat and noticed that, laid out before us, were the strategically placed betting sheets for the match. Checking out the odds (and pretending I was seasoned at this sort of thing), I noticed that the Tottenham striker, Louis Saha, was 7/1 to score the first goal. I was pretty confident going into the game about my side’s chances and Saha had been in decent scoring form since he joined, so I was very tempted. However, in between mouthfuls of roast pork (the food at the Emirates Stadium is very good by the way), I missed my chance but convinced myself that I had saved myself the princely sum of £5 in the process. So, the inevitable happened and, after just four minutes after kick-off, Saha turned in the Arsenal penalty area and his deflected shot went into the back of the net. The emotions were overwhelmingly contradictory. I was delighted that my side had scored but couldn’t celebrate as I was surrounded by Arsenal fans – so I stayed in my seat, happy but wearing a rueful smile that comes from the knowledge I could have been £40 to the good. In the end, Arsenal came back to rout Tottenham 5-2 so my team and I had both lost out. For the remainder of this story, I lay the blame squarely at my iPhone (and Rupert Murdoch). One of the apps I look at most regularly is the Sky Sports app and, a couple of weeks ago, they had a banner over the home page advertising a free £10 bet with Sky Bet, the betting site linked to Sky Sports. I pondered this and decided that by signing up and receiving a £10 free bet, I had nothing to lose. So, when the next Tottenham game came around – against our other London rivals Chelsea – I went for a ‘scorecast’ bet, with Tottenham striker Emmanuel Adebayor to score first and the game to end 2-2. The odds on this were 250/1 so I looked forward to the considerable winnings that my free £10 bet would provide. Needless to say, the match didn’t turn out that way. It was a draw, but 0-0. Adebayor didn’t play too well either. You’d think that would be the end of it, but with a bit of time on my hands in the evenings last week when I was away on business, I decided to have a bit of a flutter on the US Masters golf tournament. I had previous in golf predictions, correctly predicting Phil Mickleson to win the Masters in 2004, and Greg Norman to win the Open Championship in 1993. Of course, I hadn’t bet on either of these possibilities – but I was just 15 in 1993 so you’d be concerned if I had. Anyhow, this time out I sacrificed the princely sum of £5 again (you’ll have gathered I’m not a huge risk-taker) and, having been an avid follower of the Masters, split my £5 on two bets: £2.50 on K.J.Choi to win and £2.50 on Jason Day to win. 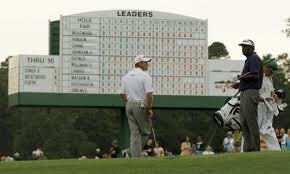 Choi has a good record in the Masters and Day is a good young golfer who was runner-up in 2011. So, what happened? Choi missed the cut (9 over par after 36 holes) whilst Day withdrew after the first round. I should have heeded the warning signs before even downloading the Sky Bet app. A couple of weeks beforehand, my wife and I had been out to Wimbledon greyhound stadium with another good friend of mine. Mrs.D and I studied the form book for each race, looking at previous results, class, running type and all the other information – in the hope that our £2 bets each time would at least pay for the admission, beer and questionable burgers. We both struck out completely, winning not a penny. My friend, however, won some money on most of the races that she put money on. Her secret? “I just picked the names I liked”, she said. So, I shall be deleting the Sky Bet app and not put my precious £5 sums of cash at risk. When my instincts kick in when the next Tottenham match or golf tournament comes around, I shall just keep my predictions quiet. And then kick myself afterwards when they come true.